Plan, track, and assess the in-depth details of your nutrition, workouts, and body measurements and transform your fitness! Perfect for fitness enthusiasts, weight loss, bodybuilders, powerlifters, sport-specific training, weightlifters, and more. 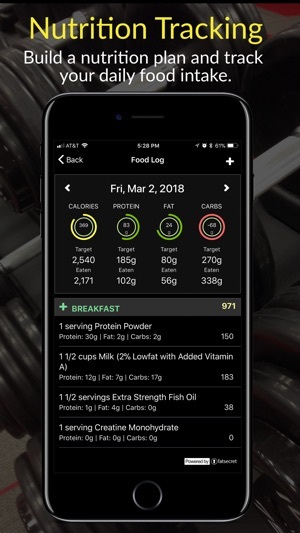 Use the nutrition plan wizard to help you create a custom nutrition plan tailored specifically to your goals and body or enter your specific calorie and macronutrient goals manually. 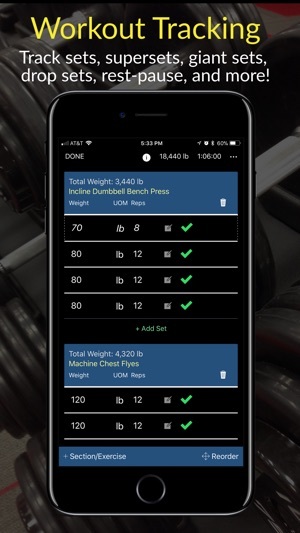 Choose from one of our built-in weight training programs and use it as-is, make modifications, or create your own from scratch using our extremely powerful and efficient training program editor. 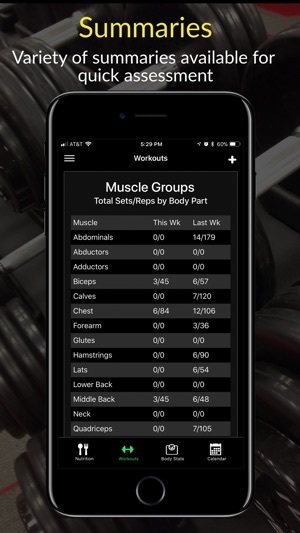 Easily track your workout details including exercises, sets, weight/reps, rest times, distance, super-sets, drop-sets, rest-pause sets, timed sets, and more. But, don't stop there! 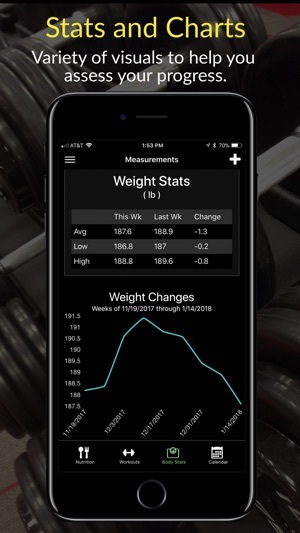 Track all of your body measurements and detailed nutrition intake to provide all the necessary data so that you and the app can thoroughly assess your progress. 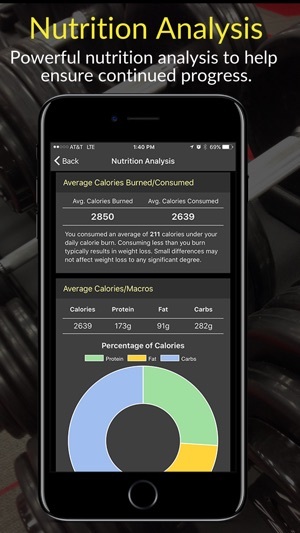 Connect with the Apple Health App to share your nutrition, workout, and measurement data. Utilize the broad variety of analysis tools and summaries to assess your progress. Gain instant access to a clear picture of your nutrition, training, and body measurements and how each area is impacting the other areas to make informed, effective decisions for adjusting your training and diet. The MyFitStatus App was developed for those who are serious about their fitness and health. All of the features were developed and tested hands-on, right in the gym. When something felt awkward or difficult to use, we changed it until it was just right. 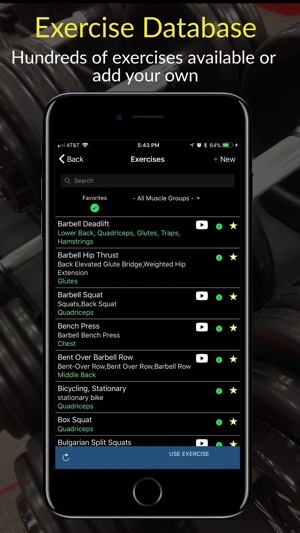 Whether your training is geared for weight loss, bodybuilding, powerlifting, weightlifting, athletics, or general fitness, MyFitStatus is an excellent tool to help you plan, track, assess, and transform your fitness! Payment will be verified at the time of purchase and charged to your credit card through your iTunes Account at the end of your free trial period. Subscription automatically renews unless auto-renew is turned off at least 24-hours before the end of the current period. Your account will be charged for renewal within 24-hours prior to the end of the current period. There will never be an increase in price when renewing. Subscriptions may be managed and auto-renewal may be turned off by going to your Account Settings in iTunes after purchase. You can also find a convenient link to your subscriptions page on the MyFitStatus "About" page as well as current subscription information including renewal date. Any unused portion of your free trial period will be forfeited when the user purchases a subscription to that publication, where applicable. Once purchased, refunds will not be provided for any unused portion of the term. 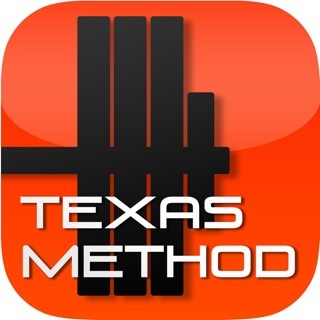 This app is very easy to use but one of the things I love most is having everything all in a single app. I can track all my food, measurements, and details of my gym workouts and then monitor my progress so I can make adjustments to stay on track. Another thing I like is the weekly updates that always provide some nice new features or improvements. Definitely recommend it. I gave it 4 stars because I wanted to integrate my Apple Health data but now they have that so I give it a solid 5 stars. We appreciate the review and glad to hear it is meeting your needs! This app has some great features and having everything is one app is really nice. 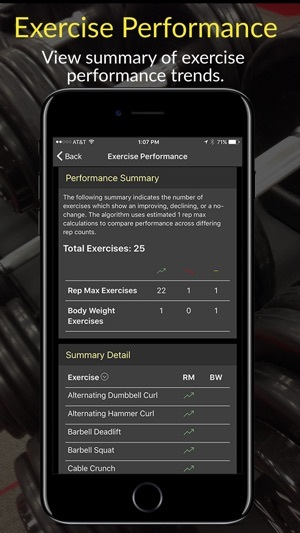 It’s easy to use and get the info I need while I’m logging my workouts in the gym which is an absolute must. The timers are really nice too (no more need for a separate app for that). I also like the support. They are very responsive and put out new features most weeks so there’s always something new to look forward to. Well worth it. Thanks for the feedback and the review. Make sure to let us know if we can do anything to assist you. 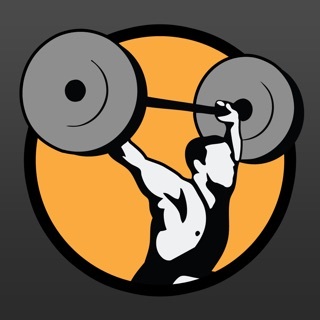 This app has everything you are looking for in a fitness app. The workout logs are great. The prebuilt workouts are good but you also have the option to input your own workouts. The nutrition side of things is awesome because you can customize your own macros. I don't think you'll find a better app that packs as much as this one does for this price. I recommend it to anybody and everybody. So glad to hear this! Thanks for the wonderful feedback and input you've been sending us to make it even better.